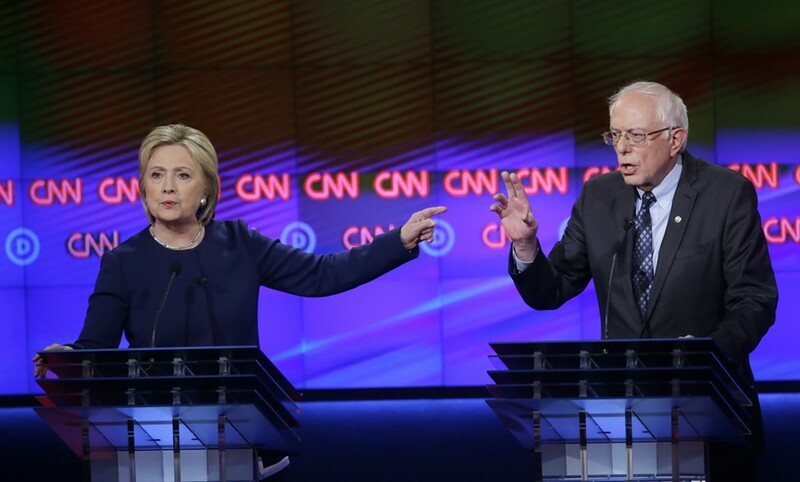 Hillary Clinton and Sen. Bernie Sanders debate Sunday night in Flint, Michigan. Three days after the Republican presidential candidates debated the size of their, um, hands on national television, their Democratic counterparts engaged in a far more substantive affair Sunday night in Flint, Mich.
With an eye toward Tuesday’s hotly contested Michigan primary, Sen. Bernie Sanders (I-Vt.) and former secretary of state Hillary Clinton lived by the words of the late U.S. House speaker Tip O’Neill: “All politics is local.” Both candidates showed up in Flint, a city plagued by a lead-poisoned water crisis, eager to display greater sympathy and resolve. For more than 20 minutes, the two mostly agreed with one another: that Michigan Gov. Rick Snyder should resign over his office’s response to the crisis, that the federal government could prevent future such calamities by investing in infrastructure and that Flint must not be forgotten once the television cameras pack up and leave. But when the subject turned to manufacturing and Clinton outlined her plan to prevent outsourcing, Sanders went in for the kill. Then came the moment that Clinton’s supporters hope will define the debate. “If you are talking about the Wall Street bailout, where some of your friends destroyed this economy through—” Sanders said, waving his right index finger at Clinton. At least twice more, Sanders made similarly dismissive remarks, prompting Clinton sympathizers to compare the episode to when Rick Lazio, her 2000 Republican Senate opponent, approached her onstage in what was characterized at the time as a bullying manner. Sanders found himself on the defensive later in the night when audience member Gene Kopf, whose daughter was nearly killed last month by a gunman in Kalamazoo, Mich., asked what the candidates would do to prevent gun violence. In her answer, Clinton noted that Sanders voted to provide firearm manufacturers and retailers immunity from lawsuits. Sanders has at times defended the vote and at times distanced himself from it. On Sunday, he appeared to defend it again. Near the end of the night, the candidates praised themselves for steering clear of the name-calling that characterized last Thursday’s Republican debate.